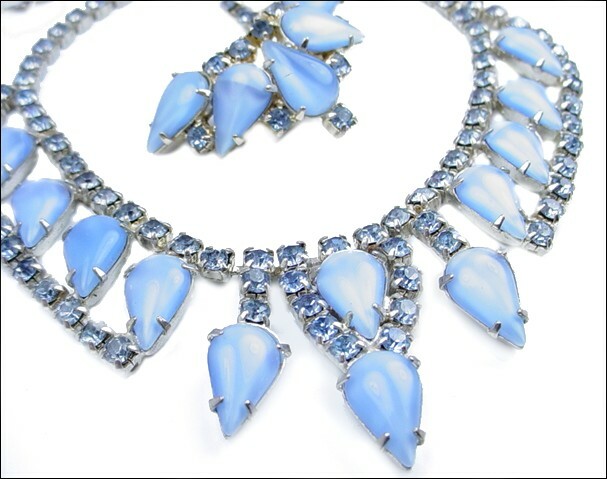 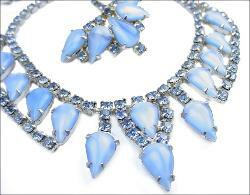 Light ice blue necklace, earrings, and brooch in silvertone. 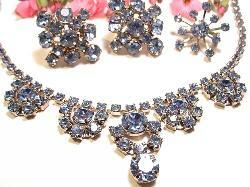 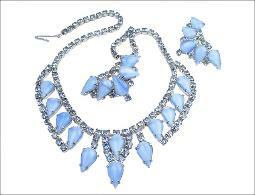 The necklace and earrings are a set, the complimentary brooch was added. .
Necklace - 15" in length, fold over clasp. 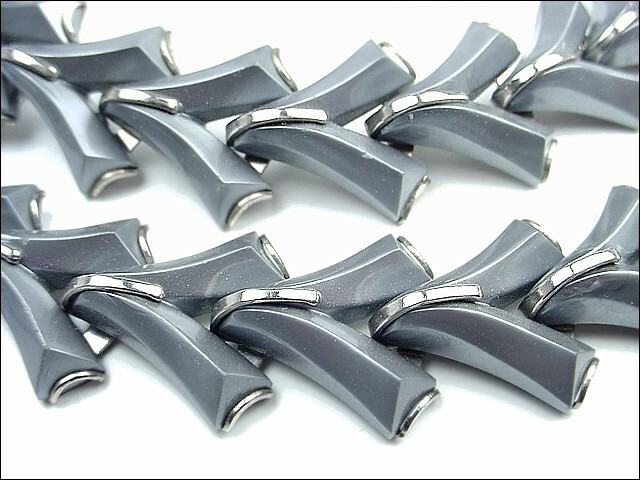 Clip earrings - 1" x 1". Brooch - compliments the set, 1". 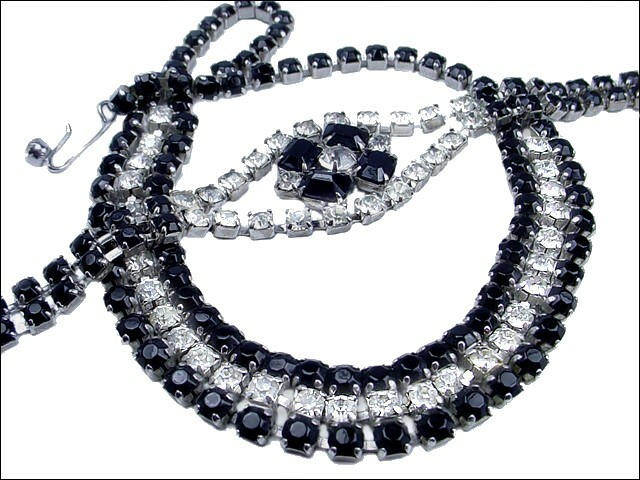 includes the J hook clasp. Bracelet - 7"L, closes with a fold over clasp. 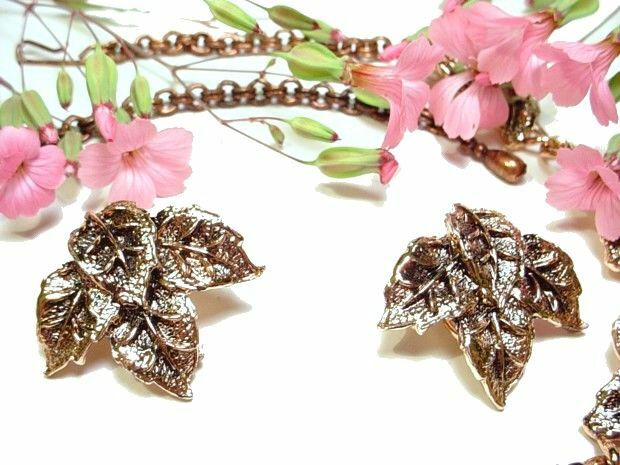 earrings - wired on multi faceted glass ABs, earring backs are riveted on, 1"W.
Rosy gold tone set with articulated leaves. 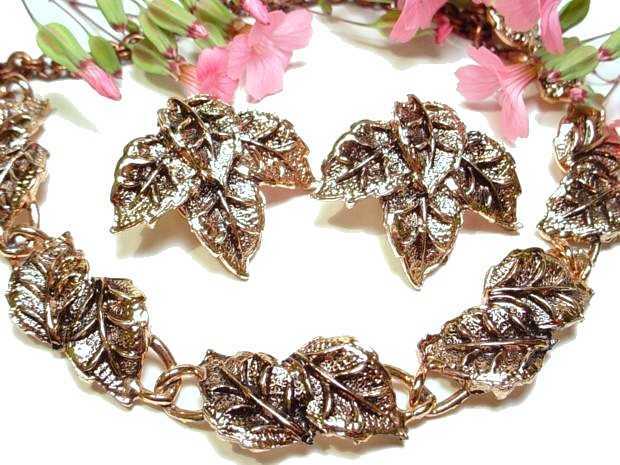 Necklace - leaves and double looped chain, overall wearable length is 15 1/2". Clip earrings - 1"L x 1 1/4W. between each, strands finishes with a decorative box clasp. 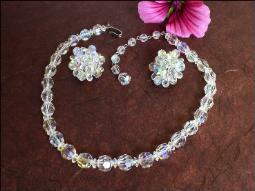 16"L. Clip earrings - have pearls surrounded with rhinestones, 1" across, inscribed posy flower on its clasp. 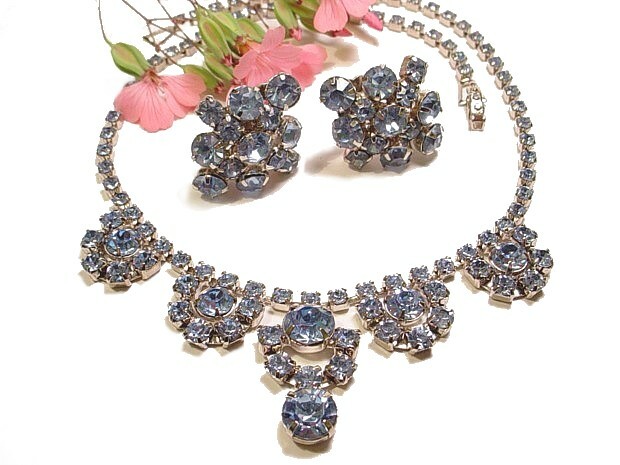 Earrings compliment the necklace very well. 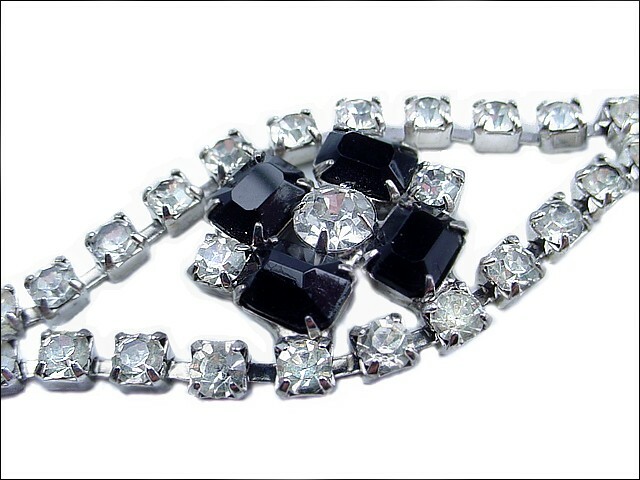 Black and clear rhinestones set into silvertone. Necklace - three rows, 14"L (doesn't include the 1/2" for the j hook clasp) x 9/16"W.
Thermoplastic Parure Matching Set, matte chrome gray color in silvertone. 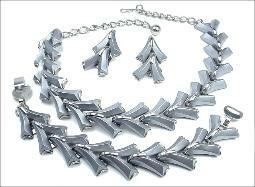 Necklace - 15"L not including 1/2" J hook closure x 7/8"W.
Bracelet - 7"L x 7/8"W. Earrings - 1 1/2"L x 7/8"W.
1 1/2" x 3/4" at their widest. Vintage Jewelry at BAVj's. 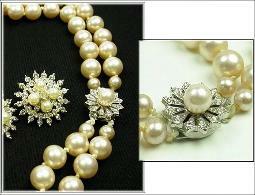 Jewelry was created to enhance your life! 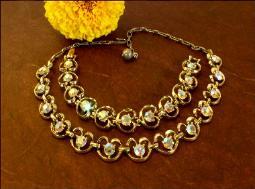 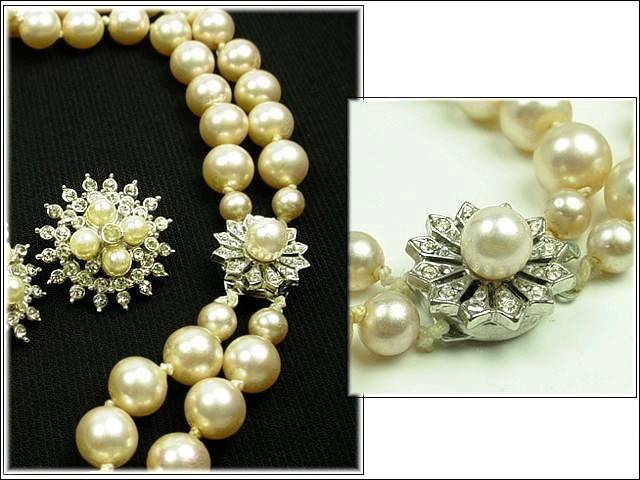 What is a Parure Jewelry Set? 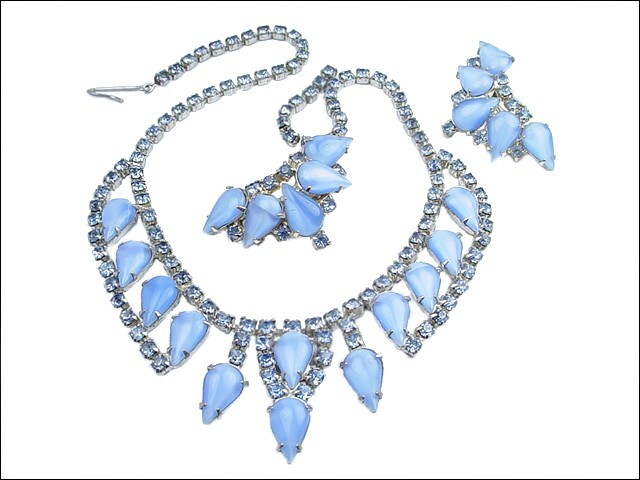 3 or more pieces to a set, all pieces match. 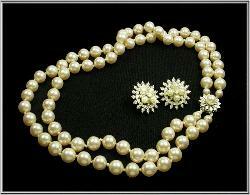 Demi-Parures? 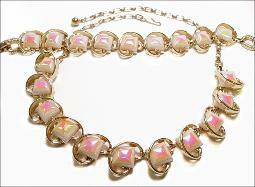 They consist of 2 matching pieces.